Romain Janil, a 3D artist based in Paris, France, works with industrial aviation companies to make flight simulation as realistic as possible. He uses Esri CityEngine 3D modeling software to populate terrain databases with buildings and other landscape elements in a pilot's field of view. "Helicopter simulations need to take place in over hundreds of thousands of square kilometers, or over densely populated areas like major cities, or sometimes both," said Janil. "I started to use CityEngine to add reality to the landscape for rescue and civilian helicopter simulation. It's the best tool to generate thousands of clean, geotypical 3D buildings with nicely resolved texture maps—even when there is no input data." "First, I immerse myself in the city I have to model," he explained. "I study architecture types and find the best way to make the buildings look recognizable. Then, I imagine the way to merge all these types to make the database. It's tempting to add more details, but we have to keep it simple so all of that data can be processed in real time." 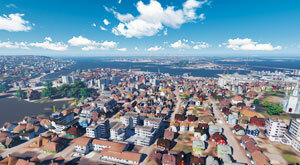 Through the course of developing his workflow, Janil said he's been amazed by CityEngine technology. 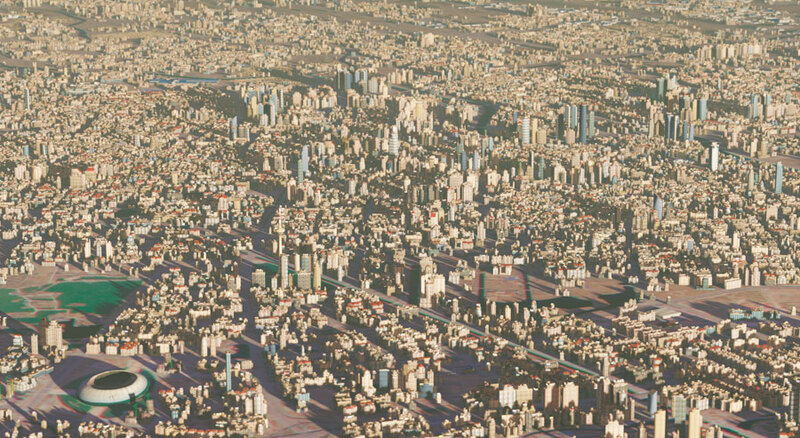 "CityEngine is a powerful tool that's very simple to use," he said. "I like the simplicity of CityEngine CGA language. There is a high level of abstraction. You can deploy generation that is multithreaded and multiprocessed." 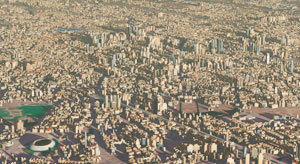 "Imagine doing Tianjin [in China]—a city of 12 million inhabitants—by hand. It's almost impossible," Janil said. "With CityEngine, you can create the field of skyscrapers and all the landscape with a great amount of detail. You can write simple rules or make them more complex. Then you can deploy all this intelligence on very large areas."